This gem was a great find, and it was just missing its handles. It actually was being used with standard round cabinet knobs, but the previous owner had some of the original handles. One, however, was broken. I was able to find a very close match on Etsy (ummm love Etsy, and they don't pay me to say that!). However, I thought it wouldn't look *quite* right since they weren't an exact match. 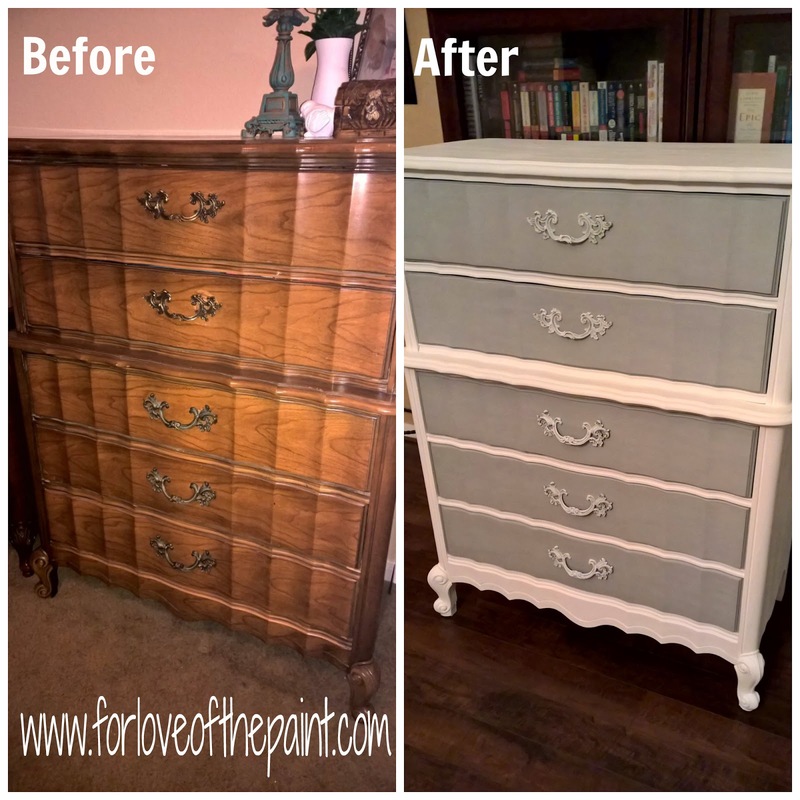 Since the chest has 5 drawers, separated by a midline, I decided to order 2 of the replacement pulls for above the midline, and use the 3 original for below. It worked out to make the shapes look very cohesive and natural for this piece! However, the colors were a little different. 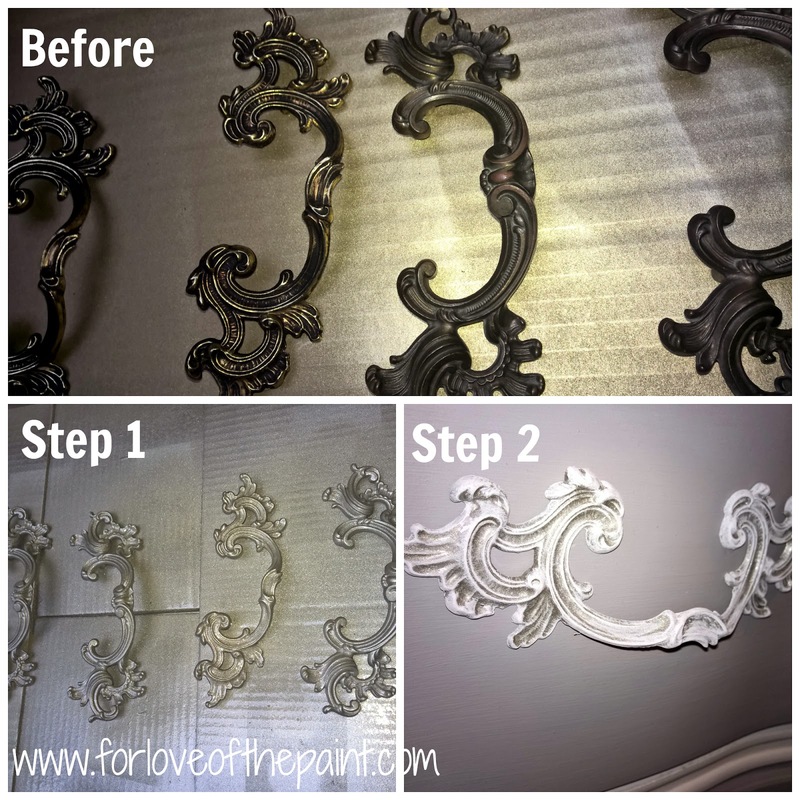 The client wanted a distressed look to the handles, but with the different color metals, I decided to first spray paint the pulls all the same color, THEN do a color wash over them. Eureka! We were on to something. Before: notice the very slightly different shape and patina to the hardware. I cleaned them well and laid them in a wide flat box so I could get them all with even passes with the spray. Step 1: several super light coats of Rustoleum spray paint, dried overnight. Step 2: dry brush of the color overlay (Pure White, in this case). I started by doing an actual wash of color, but it wasn't adhering to the hardware the way I wanted, so I wiped it off well and changed tactics to the dry brushing with barely any paint on the brush. I gradually built up color over about 3 passes per handle until it looked just right. Et Voila! I this it's gorgeous and sophisticated, and just exactly what the client envisioned. What could be better?